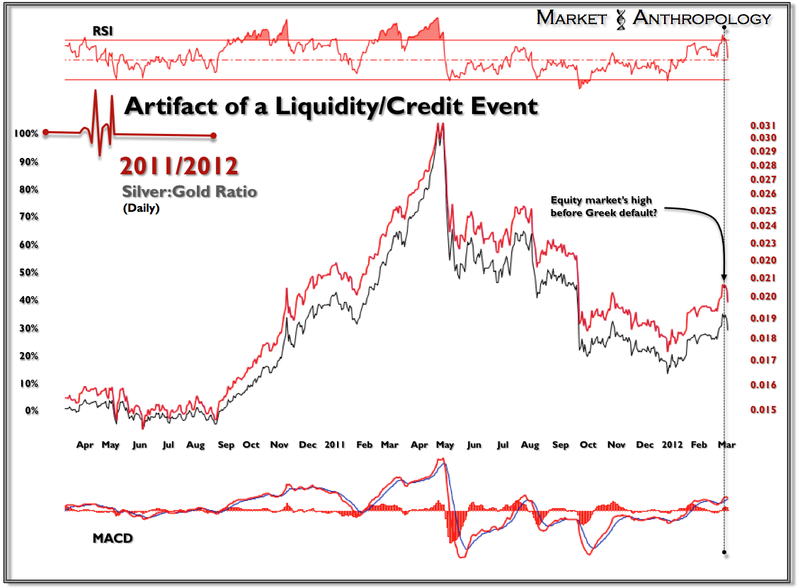 Market Anthropology: Is the Market Vulnerable? Silver says - Yes. Is the Market Vulnerable? Silver says - Yes. One of the greatest challenges in reading a market cycle or comparative trading environment, is estimating timeframes of a pivot. And although many traders will discount an analog's utility on that challenge alone, I continue to find merit in having a kinetic blueprint of how a comparative market reacted during like conditions. Of course the challenges of looking around the bend have always been present for traders and analysts alike - regardless of method, because of the respective incongruences of a market to the comparative period. This is both true for those that look at a market's fundamental underpinnings on a quarter to quarter or yearly basis and the classical application of technical analysis as well. For the record, I am not your father's technician and often work with charts more from a philosophy of price trajectory - rather than price itself. You could say I attempt at times to meld both the technical and fundamental approaches through my analog methods. Over very short time frames, traders benefit tremendously from adhering to the strict technical guidelines that the charts reveal. However, over the intermediate to longer term, in complicated macro environments where the risks are not readily apparent (i.e. today) - it makes sense to think beyond price and to contrast the broader picture, both between assets and previous markets. 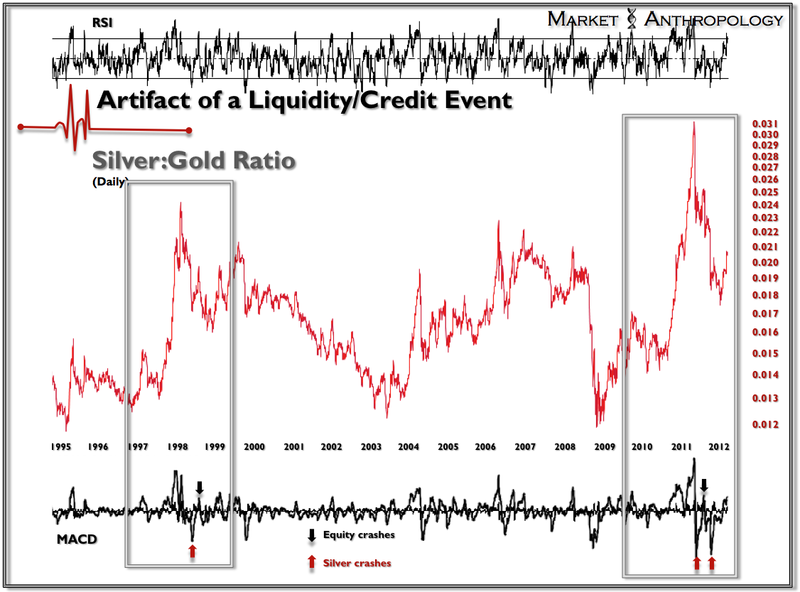 Ratio charts, specifically the silver:gold ratio - is an excellent metric in appraising where the markets may sit on the risk continuum and where the invisible tails that appear more frequently than our left brain and efficient, "the market is never wrong" - friends like to admit. 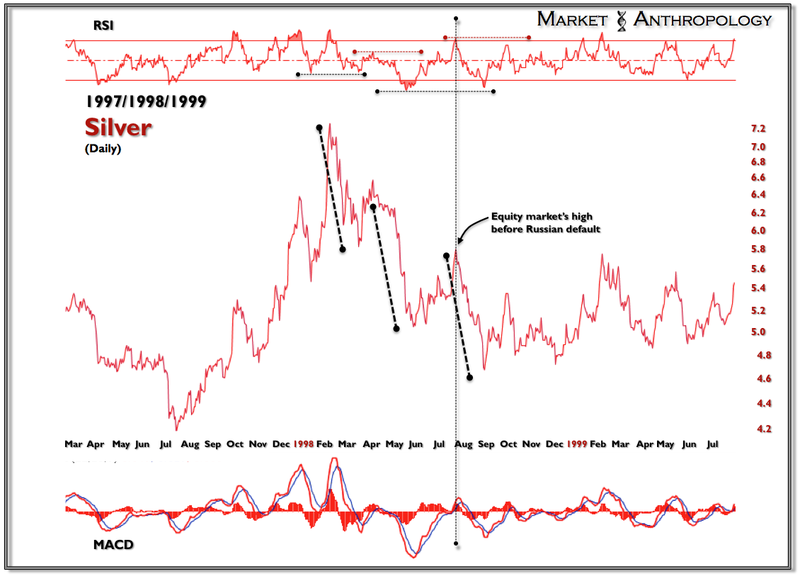 With that said, and considering the approaching an increasingly ambiguous implications of a Greek default and the market's unbridled appetite for risk in front of it, I wanted to take another look at the silver:gold ratio over the past year and contrast it to its closest comparative environment (both based on proportion, pattern, momentum and macro environment) - 1998. 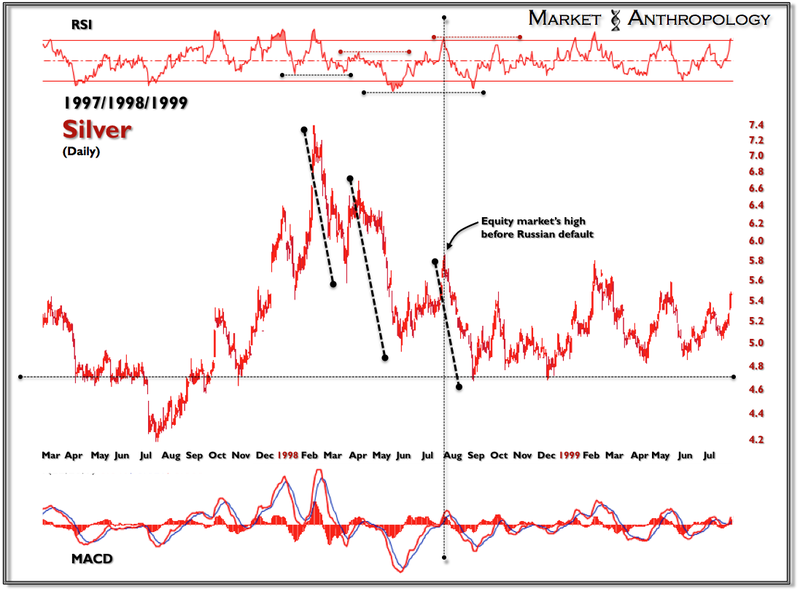 For those that don't remember, 1998 was characterized by effervescent momentum in the first half of the year, followed by Russia's sovereign debt default and the bailout of Long Term Capital Management in the fall. I initially started looking at this analog last year when silver was moving towards a parabolic blowoff during the broad momentum frenzy that characterized much of the early months of 2011. It further became incorporated in my daily analysis as the tail risks associated with Europe's considerable sovereign debt and liquidity issues roiled the capital markets and revealed themselves in the back half of 2011. Generally speaking (and why the ratio has relevance), commodity market weakness and volatility presages equity market volatility. 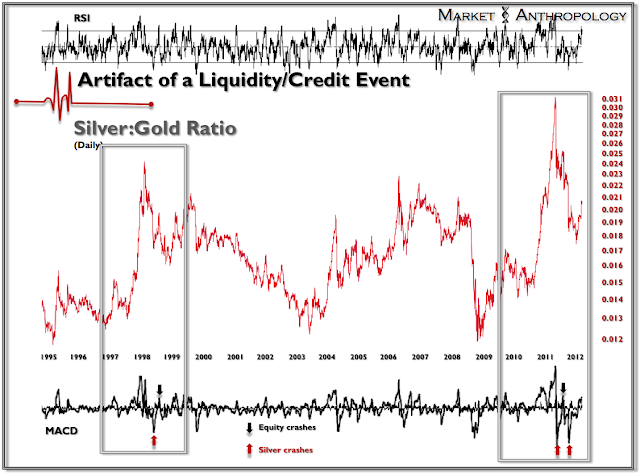 And considering silver is typically one of the more impressionable assets, both to liquidity and momentum - it bares watching both independently and crossed with its larger, albeit less volatile relative - gold. Not surprisingly, this is why the comparison and chart of silver and the silver:gold ratio from 1998 has pivoted along similar geometries to the current market, albeit along longer timeframes. In 1998, silver had three respective moves lower. 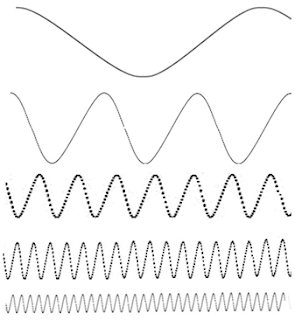 Two before the default - and one after. 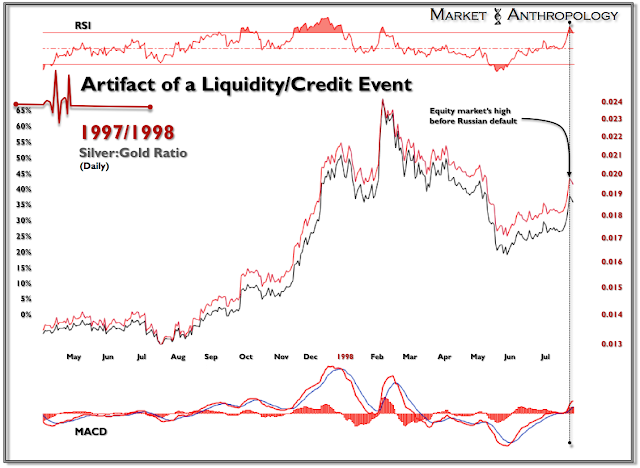 It eventually retraced the entire move after the Asian currency crisis in 1997. 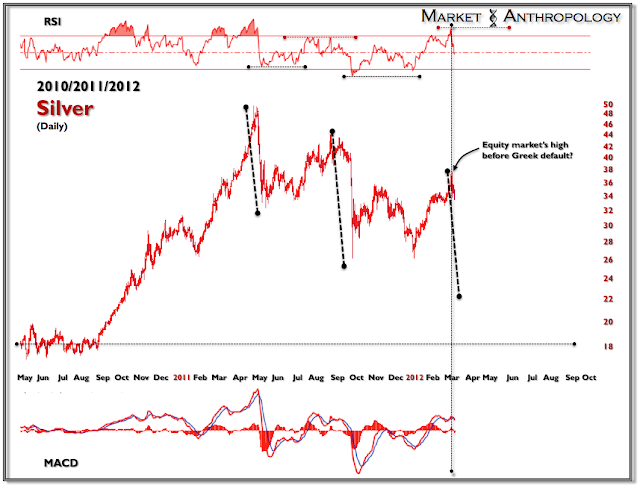 Today, silver is set-up on its third move lower and is substantially higher than the initial Greek crisis lows of 2010. I included a chart of the NDX in contrast to silver to exhibit how two of the momentum darlings of each respective period traded up to the credit event. The equity markets have continued to trade throughout 2012 like a world class momentum market. 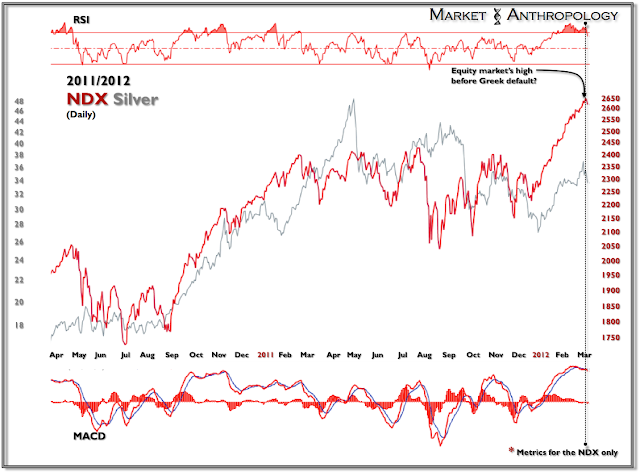 Dips have been bought and divergences that typically presage equity market weakness - ignored. And although a Greek default looms in the background, many market participants feel relieved that the ECB has mitigated the downside risks by providing historic liquidity measures, that very likely prevented a disorderly market environment at the end of last year. 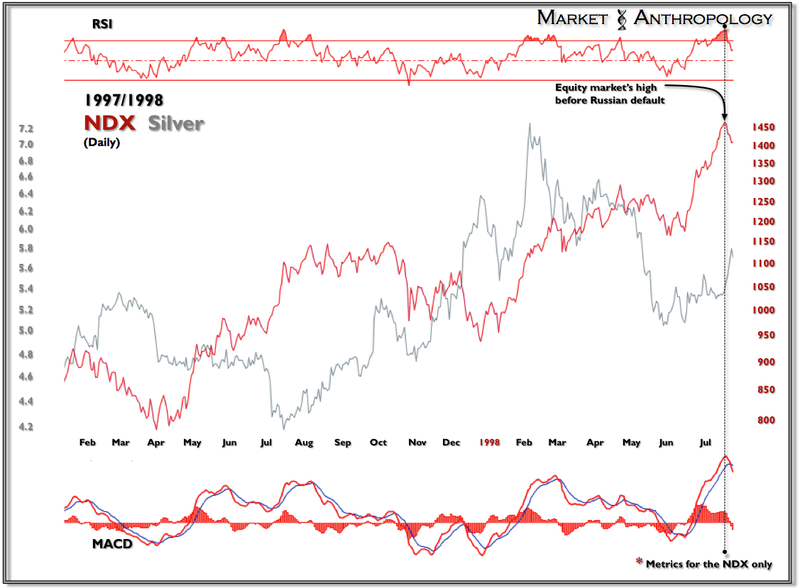 With that said - and independent of my other comparative work - the timing of silver's pivot decline over the past several sessions and the false breakout (see Here) of the silver:gold ratio last week, are bearish towards equities in the face of the approaching deadlines in Greece.